The government has decided to give licence to indian trawlers to enter in to SL EEZ and conduct the fishing operations. 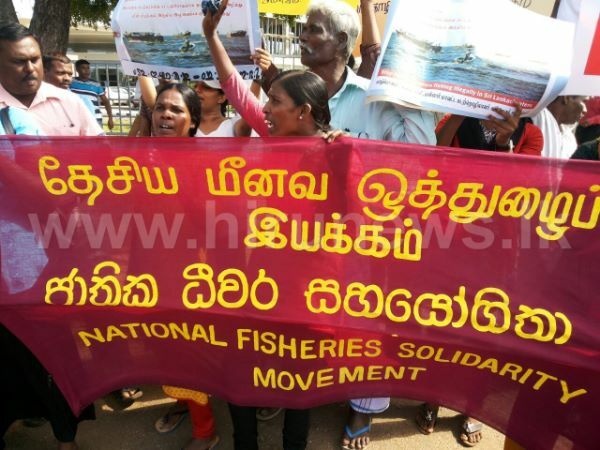 Fishermen from North fought against innovation of SL waters by indian fishers for more than 6 years and conduct discussion with the SL government and indian fishing societies as well. Non were responded positively except some proposals from indian fisher community including time allocation for them (180 days for a year) until they slowly stop their operations with time. as the previous fisheries minister Mr. Rajitha Senarathne oppose to accept the mutually built solution by communities the discussions failed and destruction continued with bottom trawling by hundreds of indian boats daily. present government under the president Mithripala Sirisena and Prim Minister Ranil Wicramasinghe has decided to licensing of indian trawlers to allow enter in to SL waters. Northern Fishers have demonstrated their opposition over government decision protesting in front of Northern Provincial Council on 12th July 2016.